Mike DeWine, Republican candidate for Governor and his wife, Fran, greet Allen County Republicans at Allen County G.O.P. Victory Center rally on Thursday afternoon. Mike DeWine addresses Allen County Republicans at Allen County G.O.P. Victory Center rally on Thursday afternoon. 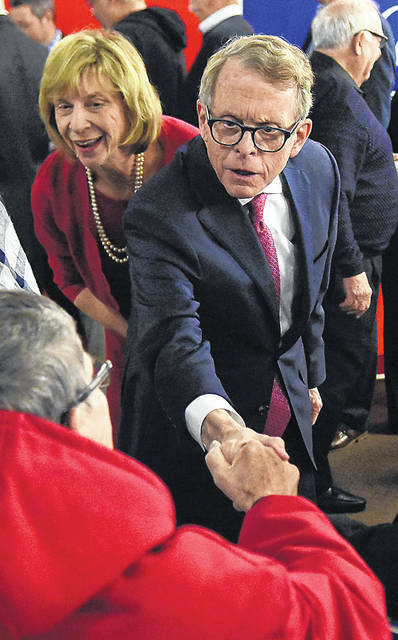 Mike DeWine and his wife, Fran, greet Allen County Republicans at a rally Thursday in Lima. LIMA — For Republicans to win against the Democratic statewide ticket on Election Day, West Ohio is going to have to step up its game. That was the message on display at the Allen County Republican Party Victory Center this Thursday afternoon during gubernatorial candidate Mike DeWine’s campaign appearance in Lima. Recent polling data has revealed that many statewide races remain neck and neck in the run up to Election Day, and speakers during Thursday’s rally, such as Republican state auditor candidate, Keith Faber, emphasized the need for the region’s conservatives to come out the meet the energy displayed by the Democratic voters in reaction to national politics. “The western side of Ohio will determine this election. It’s a very, very close race,” DeWine echoed in his speech following Faber. In the last week before Nov. 6, DeWine, his wife, Fran, and his running mate, Ohio Secretary of State Jon Husted, have been criss-crossing the state to push conservative voters to the polls. 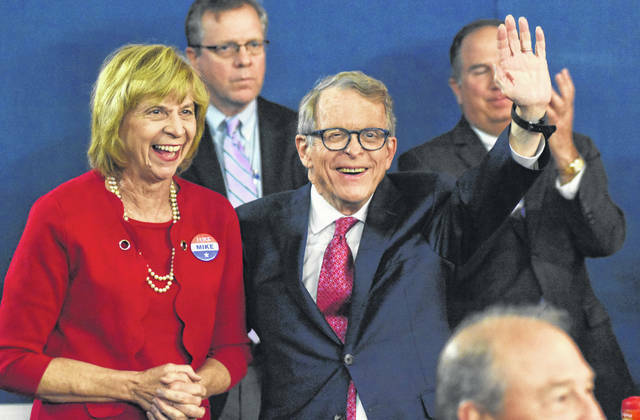 Fran DeWine said between the three of them, they’ll probably hit all 88 Ohio counties before next Tuesday — a repeat of her own tour completed last month with a stop in Lima. 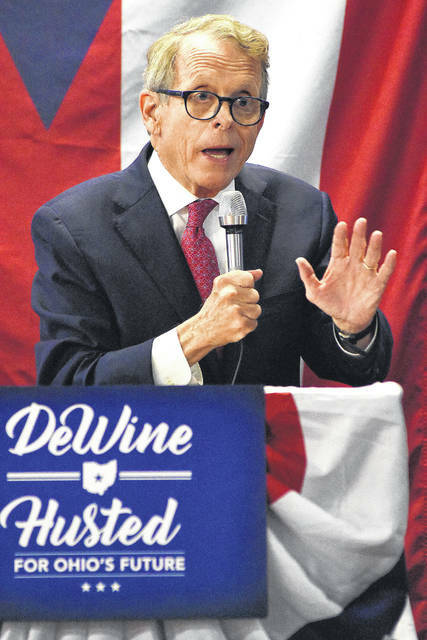 DeWine told the crowd the choice of this election is whether Ohioans want to pursue the economic prosperity of the last eight years, which he said is due to Republican policies, or are voters looking to Cordray’s proposals for Ohio, which DeWine estimated would cost $4 billion in new taxes. “We’ve gone a long way in the last eight years. We’ve made progress, but we can go further,” DeWine said. As for the meat of DeWine’s speech, the Ohio attorney general spent most of his time at the podium attacking his Democratic opponent Rich Cordray for his support of State Issue 1 — a ballot initiative that would change drug sentencing if passed — and offering his alternative drug policy. “(State Issue 1) should call into question the judgment of anyone who really understands it to be for it,” DeWine said. DeWine opposes the state amendment, and instead, he laid out his own 12-point plan to address the opioid crisis and any future drug crisis. During his speech, he spoke on three of the 12 points — to offer comprehensive drug education in schools, to expand drug courts into all 88 counties and to focus law enforcement on Mexican drug cartels, the source of much of the fentanyl in Ohio. “If you will help me get elected, my commitment to you is that I’ll work every single day, as governor, work every single day to make sure Ohio is a good place for your kids to grow up,” DeWine said.